The Fayette Pregnancy Resource Center is an organization that is unashamedly pro-life and pro-Christian. 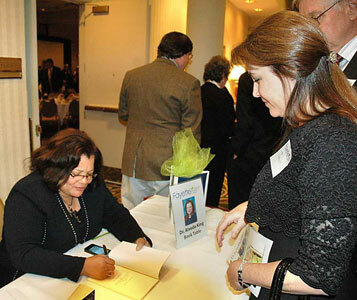 The center’s annual banquet and fundraiser at the Wyndham Peachtree Conference Center Jan. 25 featured Dr. Alveda King and was attended by several hundred residents from Fayette and Coweta counties and around southwest metro Atlanta. More a testimony than anything else, King spoke about the occurrences in her own life that dealt with life and death, birth and abortion. King noted what she had observed with the prevalence of abortion clinics across the nation, adding that many are located near college campuses. And as much as anything, King reiterated the need for continued contributions to further the cause and the mission of the Fayette Pregnancy Resource Center. Georgia Lt. Governor Casey Cagle served as emcee at the banquet. Fayette Pregnancy Resource Center Executive Director Luci Hough during the dinner said the pro-life, pro-Christian center in 2010 served 329 clients from around southwest metro Atlanta, including 223 first-time clients, and conducted 1,612 client visits at the facility. Hough said there were 77 positive pregnancy tests. Fourteen of the center’s clients were abortion-minded or vulnerable, Hough said. And in terms of number for which statistics have a diminished bearing, there were five babies saved through counseling in 2010, two minds changed from abortion to undecided, 243 Gospel presentations and 32 clients who received Christ, Hough said. Speaking in broader terms, Hough said one in 10 girls between ages 15-19 become pregnant each year to a father that is at least four years older. Many of those girls become pregnant again within a year. Hough said 78 percent of births to teen mothers occur outside of marriage. The center provides pregnancy testing, counseling, education on pregnancy, abortion alternatives, referrals for medical, housing, adoption and other services and operates a large clothes closet that dispensed more than 37,000 diapers last year. All services are free and confidential. The Fayette Pregnancy Resource Center is located in Fayetteville at 116 Bethea Road, Suite 208. The new center on Ga. Highway 54 near downtown Fayetteville is under construction and is still in need of additional funds to complete the project. For more information call 770-719-2288 or visit www.fayetteprc.com.